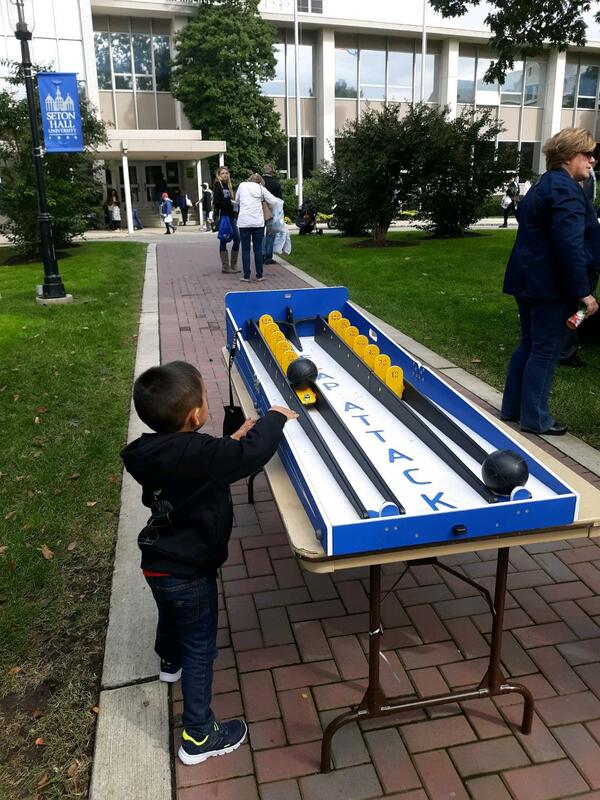 Carnival Games in NYC, NJ, and CT.
Our carnival games are unlike our competition. 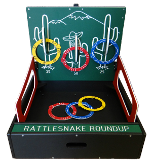 Carnival games are fun and very popular. Our games occupy a large crowd. Prices are for up to 5 hours. 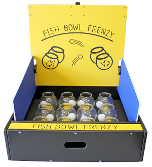 Test your aim with Fish Bowl Frenzy. You have twelve chances to land a ping pong ball in the fish bowls. Bounce it, toss it, or hit it off the backboard. Which technique is your favorite? This game is perfect for kids of all ages! Ring the rattlesnakes around the cactus arms, but don't get too comfortable with one cactus; each of them needs to be hooked with a snake of their own. The goal is simple: throw the ball and land it inside the target. Toss the ball hard enough to stick the suction cups to the board, but not too hard or the ball will fall from its mark! 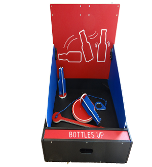 Challenge yourself to pull the bottle into an upright position using only a wand and your wits! Each bottle is a level of its own, one easier for the kids and one harder for the adults. How good is your throwing arm? 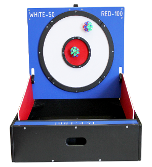 Test your aim with our line of classic bean bag toss games! 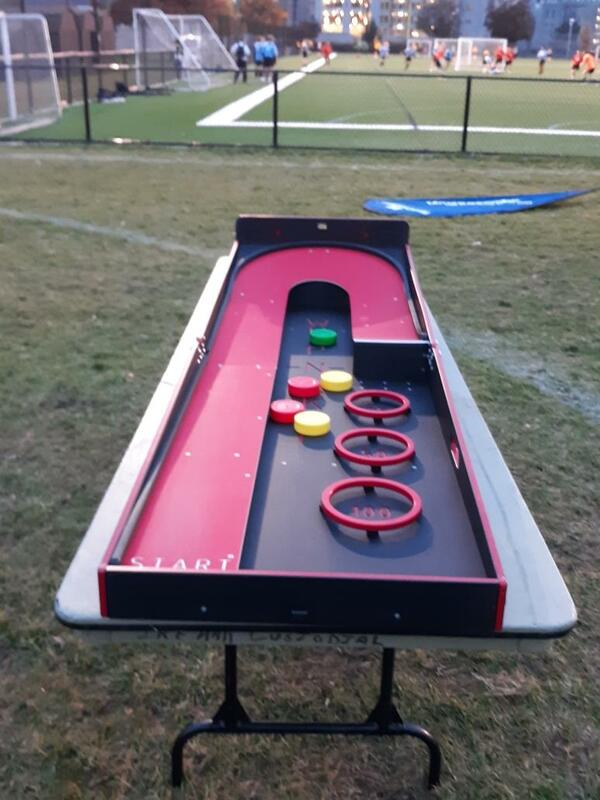 Choose your favorite of the four themes, or get them all and have a bean bag toss contest at your next event. The goal of the game is to land lizards on the log or surrounding leaves. Simply place a lizard on one end of the adjustable arm, aim, and hit the other end with the mallet to make the lizard "leap" onto the desired landing spot. You must push the ball hard enough to pass the first hill, but softly enough so that it doesn't roll all the way back! Strike Zone is bowling game with a twist! 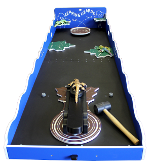 Simply slide the pucks down the alley to flip the pins! You have three chances to hit all seven! 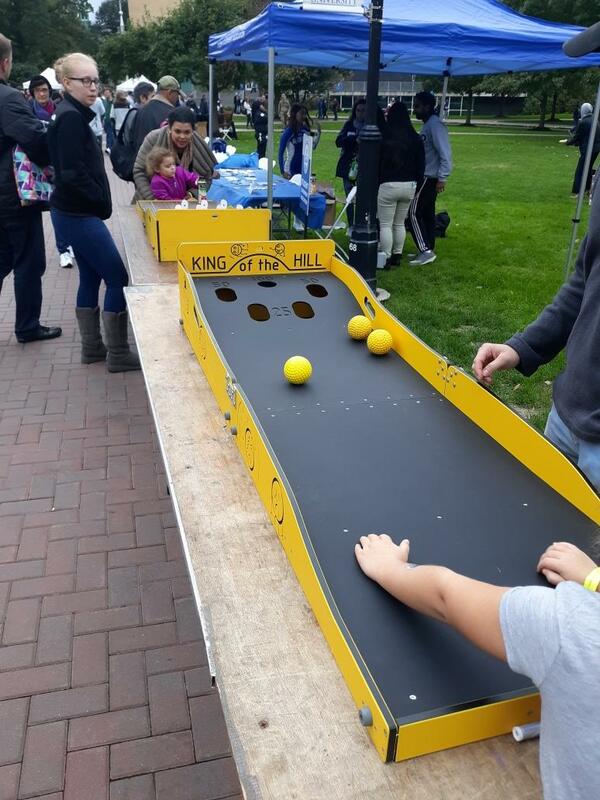 Skeeball is a fun, classic game! The goal: roll the balls up the alley and land them in one of three holes. Each hole gets progressively smaller and is worth more points than the last! Become the King of the hill in this game of skill and determination! Roll three balls up the hill to land in one of the five holes. But take note it's not as easy as it looks! A fun game that 2 people can play. Roll a ball and knock down as many flaps as possible without falling off ledge. Hoverball Archery is a fun game and one that can be played by a large crowd of people. The shell inflates and there are balls that hover over the pylons within the outer shell. You shoot safe archery arrows to knock off the balls. 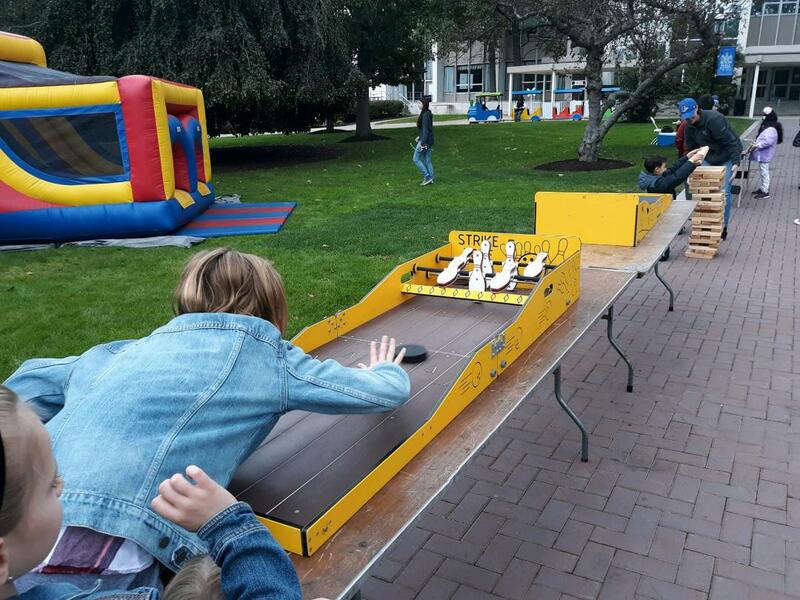 A great inflatable game that all ages can play. Each player gets 30 discs. Once a disc is in play, the only time a player is allowed to touch a disc is when the disc has passed the control line (the start bar) and has returned to the player on its own. In order for a score to count, the entire disc must pass through the front of the gate bar. 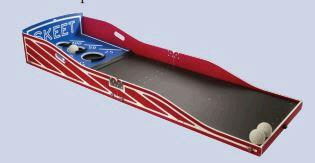 Each player gets 3 turns per set to slide as many pucks through the gate bar as possible, the goal is to get the highest score. A twist in the game; whenever a player fills each slot in a given set, their points count for double. So placing a single disc in each slot means you get 20 points for your set instead of 10. A great incentive. The gate bar is marked 2,3,4,1 from left to right. Each slot is around 2.4 inches wide, just enough space to slide your disc in. Within each of these slots is a partition that separates discs that have already passed through the gate bar. The highest score you can achieve is 148 which would so happen to occur if you managed to get 7 pucks in the 2 slot, 7 pucks in the 3 slot, 9 pucks in the 4 slot, and 7 pucks in the 1 slot. If you reach this high score (148) in 2 sub-sets, you get 1 extra disc. Make that last shot into the 4 slot and you have the highest score possible of 152! 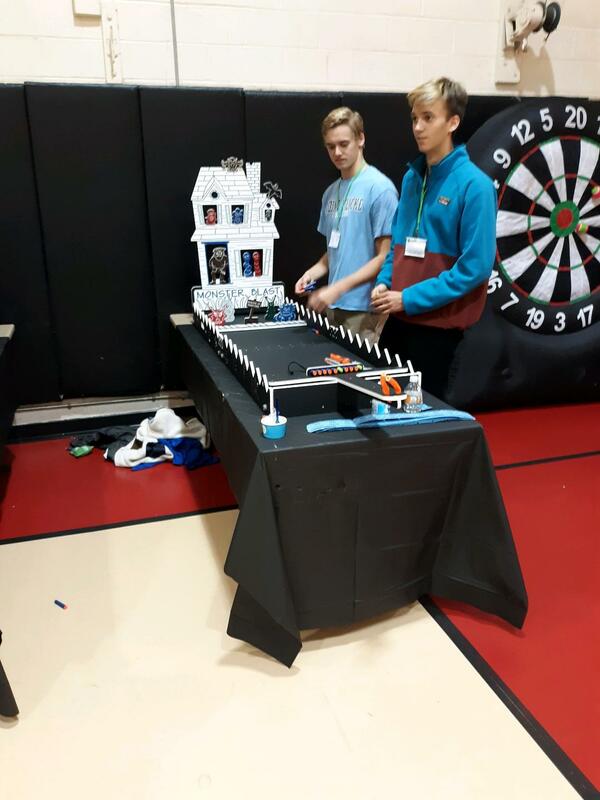 The game is around 6 1/2 feet long. 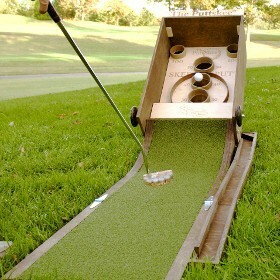 This great games combines Putting and Skeeball. Many people can play at an event. 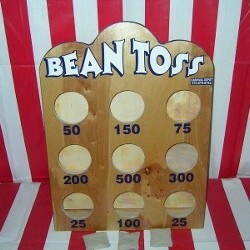 Bean Toss is a carnival game complete with game board and 3 bean bags. Best played on a table. 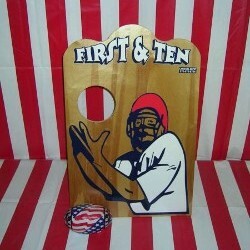 First and Ten is a carnival game complete with game board and 2 soft stuffed footballs. Best played on a table. 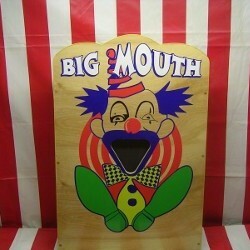 Big Mouth is a carnival game complete with game board and2 dead baseballs. Best played on a table. 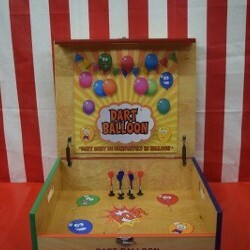 Dart Balloon is a carnival game. Throw 6 suction darts and hit a balloon. 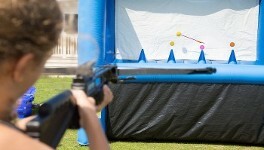 Fun for any school event of fundraiser or backyard party. Best played on a table. 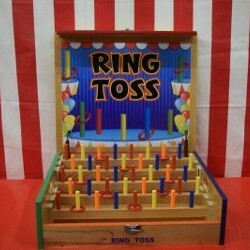 Ring Toss is a carnival game. Toss one of 1 rings onto a ring. Best played on a table. Call 917-484-2704 now to book games at your next event. Look at our sister site for additional games and products.